Garry Winogrand, Central Park Zoo. New York City, 1967. 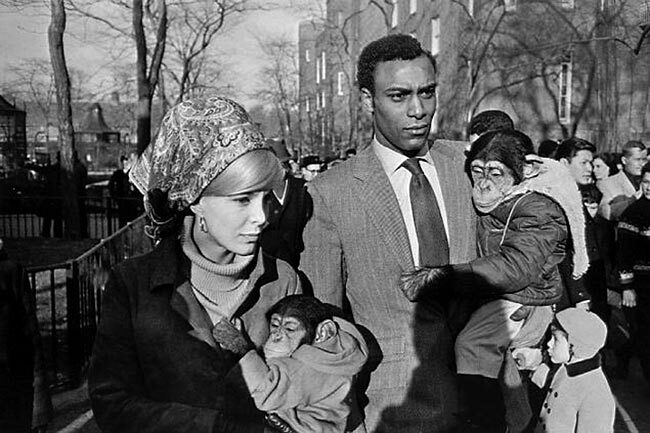 As a follow-up to our recent posts, Sightseeing with Garry Winogrand and On the Road with Garry Winograd, we present the following collective Garry Winogrand interview, Monkeys Make the Problem More Difficult, excerpted from American Suburb X. Originally Published in Image Magazine by George Eastman House – Vol. 15, No. 2, July, 1972. Yes, monkeys DO make the problem more difficult. Especially if, as in the photograph above, they are chimpanzees. Rochester Institute of Technology, October 9, 1970. Garry Winogrand (1928-1984) spent two days in Rochester, New York, in October, 1970. On Friday, the 9th, he was the guest of the Rochester Institute of Technology. On Saturday, the 10th, he visited the Visual Studies Workshop, also in Rochester. The format was identical on both occasions: Winogrand, without comment, showed slides of his latest work and then answered questions from the student audiences. All in all, he talked for over five hours. The following transcript, edited from a tape recording of the proceedings, represents but one idea among the many ideas that were touched on. STUDENT: —and the people kind of wandering in and out. Now, it might be due to my own ignorance or something, but could you give me like a straight answer as to what you’re trying to say in that photograph? GW: I have nothing to say. STUDENT: Nothing to say? Then why do you print it? GW: I don’t have anything to say in any picture. STUDENT: Why do you print it if it has no meaning? GW: With that particular picture—ah, I’m interested in the space and I maybe can learn something about photography. That’s what I get from photographs; if I’m lucky, I can learn something. STUDENT: Then you’re trying to reveal something about space? GW: I’m not revealing anything. STUDENT: Then what do you think is the purpose of the photograph if you’re not revealing anything. STUDENT: Then what’s the purpose of that? That’s what I’m trying to find out. The discussion continued the next day. STUDENT: I can’t tell you, but if you’d do it again I might get a closer idea. GW: My only interest in photographing is photography. That’s really the answer. GW: When you photograph—there’s [sic] things in a photograph. Right? STUDENT: But that’s not what you’re concerned about. I mean, your concern is photography. GW: That’s it. And I have to photograph where I am. GW: Then that’s what the pictures would look like, whatever those places look like. STUDENT: Is your choice of subject matter just limited by where you are, by the fact that you live in New York? GW: Yeah, I mean there are pictures in here from California and some other places, too. STUDENT: Yeah. But you return to certain things, though, which have more to do than just with place. Like you’ve got a thing about dogs no matter where they are. STUDENT: You’ve got a thing about, say, personal injury. GW: That has to do with photography—I’m not interested in injuries. Believe me I’m not. GW: Listen, it’s interesting; but it’s interesting for photographic reasons, really. STUDENT: What are photographic reasons? GW: Basically, I mean, ah—well, let’s say that for me anyway when a photograph is interesting, it’s interesting because of the kind of photographic problem it states—which has to do with the . . . contest between content and form. And, you know, in terms of content, you can make a problem for yourself, I mean, make the contest difficult, let’s say, with certain subject matter that is inherently dramatic. An injury could be, a dwarf can be, a monkey—if you run into a monkey in some idiot context, automatically you’ve got a very real problem taking place in the photograph. I mean, how do you beat it? STUDENT: Are you saying then that your primary concern is a kind of formal one? STUDENT: In what sense “formal?” Getting things on the page? Filling up the space? GW: You can’t help doing that either; I mean, it just automatically happens when you make an exposure. STUDENT: Well, then I don’t understand what the “formal” problem is. STUDENT: to make it not look formal. GW: No, sorry. . . . You’ve got a number of things that take place that are peculiar to still photography. One: how a picture looks—what you photograph is responsible for how a photograph looks. In other words, it’s responsible for the form. STUDENT: It, or are you? GW: What you photograph is responsible for how a photograph looks —the form, the design, whatever word you want to use. Because of that there’s no way a photograph has to look … in a sense. There are no formal rules of design that can apply. In other words, a photograph can look anyway. It just depends basically on what you photograph. STUDENT: Well, the choice of the 28 mm. lens over a 50 mm. is going to give you a different looking photograph. GW: It makes the problem—it ups the ante in a way, if you want to put it that way. You have more to contend with. Maybe it makes the problem a little bit more interesting. STUDENT: I always feel very precarious when I look at your images. I feel like I’m falling over. Is that because you’re not—you don’t use a view-finder? GW: I don’t know why you feel the way you feel. . . . What are you asking? STUDENT: Actually, what I’m asking is do you often shoot without using your viewfinder? GW: I never shoot without using the viewfinder—Oh, yes, there’ll be a few times,—I may have to hold the camera up over my head because for just physical reasons, but very rarely does that ever work. STUDENT: Are you conscious of that? STUDENT: Of sort of an off-kilter thing happening? GW: Oh, yeah, sure. I pretty much know what I’m doing. STUDENT: Is that an attempt to solve a photographic problem? GW: Generally it’s to make one. Another reason can be just because physically I might have trouble to get what I want to include in [the frame] in, you know, just physically. And that’s a good reason. STUDENT: I’m wondering what, like, your concern with this is. Why photography? GW: I told you before. It’s, ah—the thing itself is fascinating. The game, let’s say, of trying to state photographic problems is, for me, absolutely fascinating. STUDENT: You keep trying to know more and more about the game? GW: I’m trying to learn more and more about what’s possible, you know—really, I am answering your question. STUDENT: Any change in your work you would attribute to somehow learning—the learning process? GW: Yeah. I think if I did a tight editing, let’s say, of this bunch [of photographs], I’d say I’m a different photographer here than from those animals or whatever. GW: Basically, they were done in a relatively concentrated period of time. I mean, I wasn’t just working on them. But, I’d say I can safely say over a year’s—about a year I went on—yeah, when I knew I had a game to play there. . . .
STUDENT: Do you look at a lot of other people’s photographs? GW: Sure. I look at photographs. STUDENT: Whose photographs do you find interesting? GW: Quickly, off the top of my head: Atget, Brassai, Kertesz, Weston, Walker Evans, Robert Frank, Bresson. STUDENT: Do you like them for different reasons or do you find a reason? GW: I learn from them. I can learn from them. GW: It’s not a question of solving. It’s a question of stating. GW: Yeah. You don’t solve anything ever, really. You simply state a problem which, when you’re lucky, gives you some idea of what possible problems you can—it indicates, you know, your future headaches. STUDENT: But that’s all related to the idea of the “game”—it’s being a “game”? GW: I use the word “play”; but you understand the word “play”—if you ever watch children play—what do you observe when you watch children play? You know, they’re dead serious. They’re not on vacation. STUDENT: If the problem you’re working on now is the contest between form and content, what was the problem before? GW: It’s always—every photograph, every—somehow bang of the shutter—basically, I’m playing the “game” in a way. STUDENT: When you first started photographing what was your, like primary interest in picking up the camera? Did you like people? GW: No, the process, really. I really liked—it was a very crazy thing to me, I mean, this business of being uncertain that it would come out. I still enjoy—I still don’t understand why when you put a piece of paper in a tray with solution in it, it comes up. It’s still, in a sense, magic to me. It’s a funny thing, you know. I’ve got two kids, and when they were very young, they used to come in the darkroom and I thought they’d be astounded by that. Nothing. When they got a little older, then they got astounded by it. . . .
STUDENT: Is it relevant to ask what you were doing before you began to take pictures? GW: I don’t know. … I had a camera but I had no darkroom facilities, nothing like that was available. And so, you know, I shot a roll of film, I sent it in, and stuff like that. And I was painting. I was studying painting which is not valid because it’s ridiculous to talk about it. But I was at Columbia [University] and they had a camera club. I think I registered there for the fall term. And so I found out about this camera club and they told me they had this darkroom available twenty-four hours a day. And I’d never done any darkroom work, so I went down. It must have been two weeks after I started there and, I’d say, give it another week and I never went back to class. I’m telling you, it was basically the process. . . .
STUDENT: I’m interested to learn, like, when you looked in the book, like, do you think there’s anything you can say afterwards what, you know, “I learned” or what might be different in your work afterward? GW: Well, let’s put it—you have to talk, speak about photographs, specific photographs. . . . Let’s say, primarily—let’s say Walker Evans in a general sense was maybe the first man who, in his book, states that you could—or rather the work states that America was a place to photograph in. Just on that level. Of course, there’s much more about those photographs; they’re astounding. STUDENT: You think you can get different things from a specific photograph? GW: Yeah, you can go into your own mumbo-jumbo. STUDENT: Would you go into a mumbo-jumbo about [Robert] Frank’s photograph of the flag or would you just look at it? GW: That photograph doesn’t interest me that much. There are photographs in there far more interesting. The gasoline station photograph would be. STUDENT: Would you go into a mumbo-jumbo or would you just look at it? GW: That [the gasoline station] photograph, in the first place, is an exercise in, ah—it’s a lesson, number one, in just camera operation, in a sense. It’s a lesson in how responsible that machine is for how photographs can look. Begin with that. To me that was one of the most important pictures in the book. It’s also a photograph of nothing, there’s nothing happening there. I mean, the subject matter has no dramatic ability of its own whatsoever and yet somehow it looks, what it is, it’s the most mundane—and there’s nothing happening, there’s no physical action. STUDENT: You get the feeling that he played the game very well? GW: Extremely well. That he could conceive of that being a photograph in the first place, is, ah—I don’t know if he, on any conscious level, thinks in terms of this “game” or whatever. And I certainly don’t really, in a conscious way, worry about it when I’m working. The contest between form and content is what, is what art is about—it’s art history. That’s what basically everybody has ever contended with. The problem is uniquely complex in still photography. GW: Well, in terms of what a camera does. Again, you go back to that original idea that what you photograph is responsible for how it [the photograph] looks. And it’s not plastic, in a way. The problem is unique in photographic terms. STUDENT: Well, if what you photograph is responsible for what it looks like, what if ten people take a photograph of the same thing? STUDENT: What is it, say, in a picture that makes it interesting instead of dead; what makes it alive instead of dead? GW: Well, let’s say—let’s go back to that gasoline picture. . . . Let’s say, [it’s] the photographer’s understanding of possibilities. Let me say something else. When he [Robert Frank] took that photograph he couldn’t possibly know—he just could not know that it would work, that it would be a photograph. He knew he probably had a chance. In other words, he cannot know what that’s going to look like as a photograph. I mean, understanding fully that he’s going to render what he sees, he still does not know what it’s going to look like as a photograph. Something, the fact of photographing something changes—I mean, when you photograph—if I photograph you I don’t have you, I have a photograph of you. It’s got its own thing. That’s really what photography, still photography, is about. In the simplest sentence, I photograph to find out what something will look like photographed. Basically, that’s why I photograph, in the simplest language. That’s the beginning of it and then we get to play the games. STUDENT: But the thing that’s intriguing is not really knowing what the result is going to be like. GW: Of course. What I know bores me. You know, you get into the business of commercial photography, and that’s all you do is photograph what you know. That’s what you’re hired for. And it’s very easy to make successful photographs—-it’s very easy. I’m a good craftsman and I can have this particular intention: let’s say, I want a photograph that’s going to push a certain button in an audience, to make them laugh or love, feel warm or hate or what—I know how to do this. It’s the easiest thing in the world to do that, to make successful photographs. It’s a bore. I certainly never wanted to be a photographer to bore myself. It’s no fun—life is too short. . . .
STUDENT: Do you shoot pool? GW: I have, yeah. I was good. Ah, yeah, why? STUDENT: You feel you’ve been hustled in a pool room. . . . Are there any other things that relate photographically that are not necessarily other photographs? By this I mean, do you ever get ideas—not ideas—is your education ever expanded by an interest in something else other than photography? GW: I would think so. A heck of a lot. Reading and music and painting and sculpture and other stuff. Basketball, baseball, hockey, etc. Certainly, you know, you can always learn from some—from somebody else’s—from some intelligence. I think. I hope. Nobody exists in a vacuum. Where do you come from? The first time I really got out of New York as a photographer was in 1955 and I wanted to go around the country photographing. And a friend of mine at that time, I was talking to him about it—a guy named Dan Weiner. I don’t know if you know his name. He’s dead now. [He] asked me if I had ever seen Walker Evans’ book and I said, no. I had never heard of Walker Evans. He said, if you’re going around the country, take a look at the book. And he did me a big fat favor. And then it’s funny, I forget what year when Robert Frank’s book came out. He was working pretty much around that time, ’55 or whenever it was. And there were photographs in there, particularly that gas station photograph, that I learned an immense amount from. I mean, I hope I learned. At least, I feel very responsible . . . [tape unclear]. STUDENT: What you’re responding to, is it the quality of the intelligence that states the problem? GW: Yeah, I don’t give a rap about gasoline stations. . .